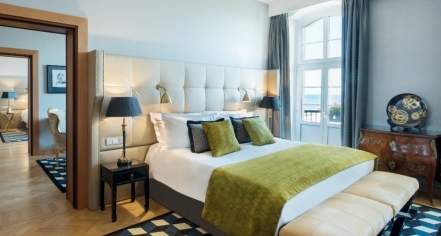 The Sofitel Grand Sopot features 126 luxury guestrooms, including 43 suites, that make travelers feel comfortable and at ease in an elegant, modern setting. 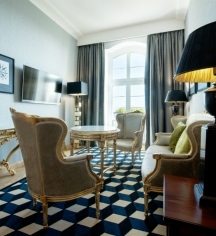 Each guest room features large windows and a magnificent view of the Baltic Sea or Północny Park. Mimicking the colors of the natural beauty around the hotel and drawing on the beauty of the Baltic Sea and Scandinavian style, guestrooms are decorated in whites, soft blues, and natural tones with light-grained wooden herringbone floors and headboards. Flat-screen televisions stand in front of huge beds, and rooms feature touches of classic style, making guests feel as important as the hotel’s most famous guests. The luxurious, connected baths feature bathrobes, slippers, and luxury bath amenities. Accessible and adjoining rooms are available.